The Elodie Details dummy chain makes sure the dummy does not end up on the floor. 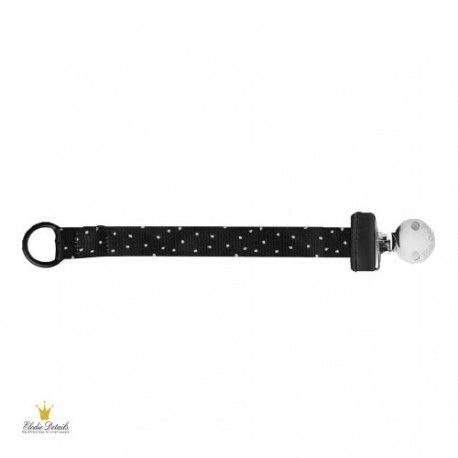 The dummy chain is black with pretty white dots. The Elodie Details dummy chain is a hygienic and practical way of keeping track of the dummies. The dummy chain attaches to clothes with a silver metal clip, nickel-free, and the dummy is then attached to the dummy chain with a little rubber ring. The dummy chain works for dummies both with and without ring. The dummy chain measures 22 cm and is made of 100% nylon. It is recommended to wipe it off with a damp cloth. All Elodie Details’ dummy chains cohere to EU standard EN 12586.